When you’re not shopping, the holiday season can be an excellent time to take in a great flick. 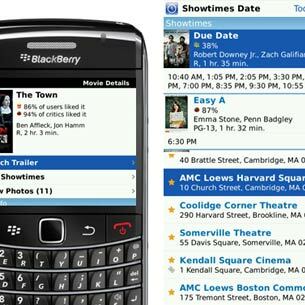 The free Flixster for BlackBerry app provides access to a variety of movie-information, including show times for local theatres, maps and contact details to help you get there, ticket prices and more. And you can use the app to purchase tickets online via MovieTickets.com. You can also watch movie trailers in some cases and read film-reviews from RottenTomatoes.com. 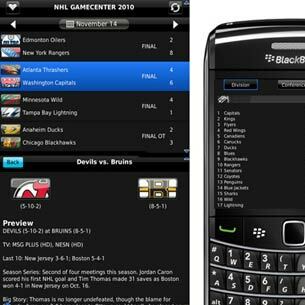 Keeping tabs on your favorite hockey team while rushing through busy stores and carting kids can be a challenge, but thanks to NHL Game Center 2010 for BlackBerry, it’s manageable. The free hockey app offers scores, stats, play-by-play action, game photos, standings, schedules and much more. A $20 “premium” version adds video highlights and live game radio broadcasts, while the full “live” version costs $80 a year but offers live game video. Smart holiday shoppers grab their gifts online, from the comfort of their own homes. 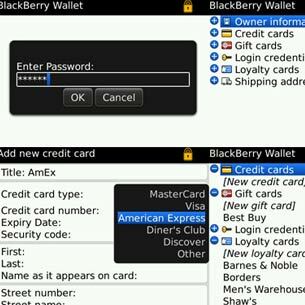 RIM’s free BlackBerry Wallet app is a safe and convenient way to store and access all of your various retailer loyalty cards, as well as payment card information and shipping addresses. BlackBerry Wallet can also supposedly populate the appropriate fields on a Website with your financial information while making a purchase to save you time. Holiday shopping, related-travel and schmoozing with the in-laws can be frigid, tiring business. But as long as there’s a Starbucks nearby, you always have a warm caffeine boost within reach. 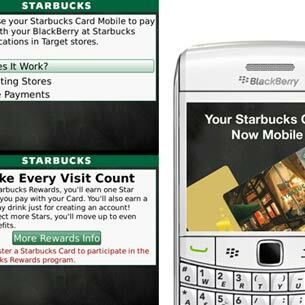 And with the Starbucks Card Mobile App for BlackBerry–and a valid Starbucks card associated with it–you need only open up the app and share your account info to purchase anything Starbucks has to offer. In some locations, namely Target stores, baristas can even scan your BlackBerry to collect payment info. Let’s face it: purchasing holiday gifts is frequently a gamble. 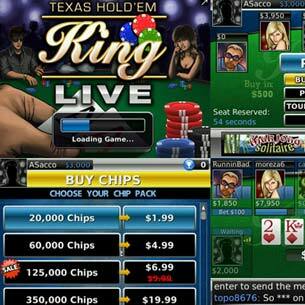 But the free, Texas Hold’em King (THK) Live app for BlackBerry offers up another, lower-pressure form of for-fun holiday gambling. Poker fans can play online with other THK Live users, chat with other gamers, and rack up faux riches, from the car during travel or while standing in line waiting to pay for gifts — anywhere you can tote your BlackBerry smart phone. Are you a Basketball buff who can’t stand the thought of missing your team play due to a holiday engagement? Yeah. Me too. 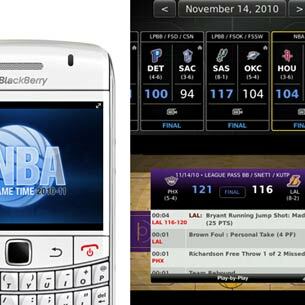 The NBA Game Time 2010-11 app helps ensure that never has to happen. With team and player stats for every game, live scores, starting lineup reports and conference and league standings, the free, “lite” version is all most fans should need to stay up to date. But a $10 premium version also offers live-game audio and video highlights. Every smart phone-toting holiday traveler should be equipped with some sort of weather app, and BeWeather for BlackBerry is the best available for RIM smartphones. It’s not free, at $9.99 — a three-day trial version is available — but BeWeather’s mostly-accurate weather data and vast array of customization options make it well worth the price. The developers update it frequently, as well, regularly adding new features and functionality. Just because you’re out and about, taking care of some last-minute gift-ideas or en route to the next holiday get-together, doesn’t mean you can’t stay up to date on Twitter. 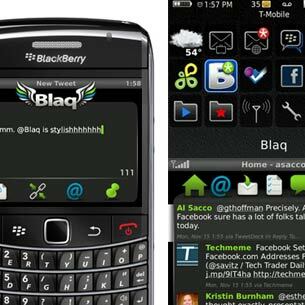 Mobile Twitter apps come a dime a dozen these days but what sets Blaq apart from other Twitter apps is its exceptional design and feel, and its impressive list of customization options. It costs $4.99, but that’s one five-spot you won’t regret dropping. 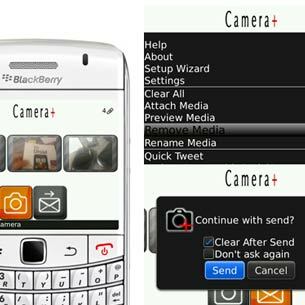 Fixmo Tools is a collection of utilities for BlackBerry that help keep your device running as smoothly as possible, among others things. And device health is of the utmost importance for holiday travelers — how else can you ensure access to all of the valuable apps mentioned in this slideshow? 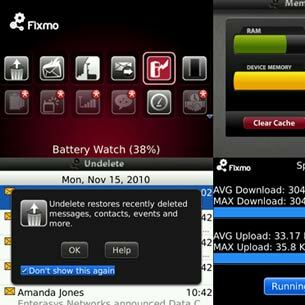 The $15-software — Fixmo is currently on sale for $10 — packs a battery-watch app, with alerts; a memory-monitoring tool; an “undelete” utility that lets you recover deleted message; and much, much more.